100% of The Late Show’s proceeds from this book go to hurricane relief. Whose Boat Is This Boat? 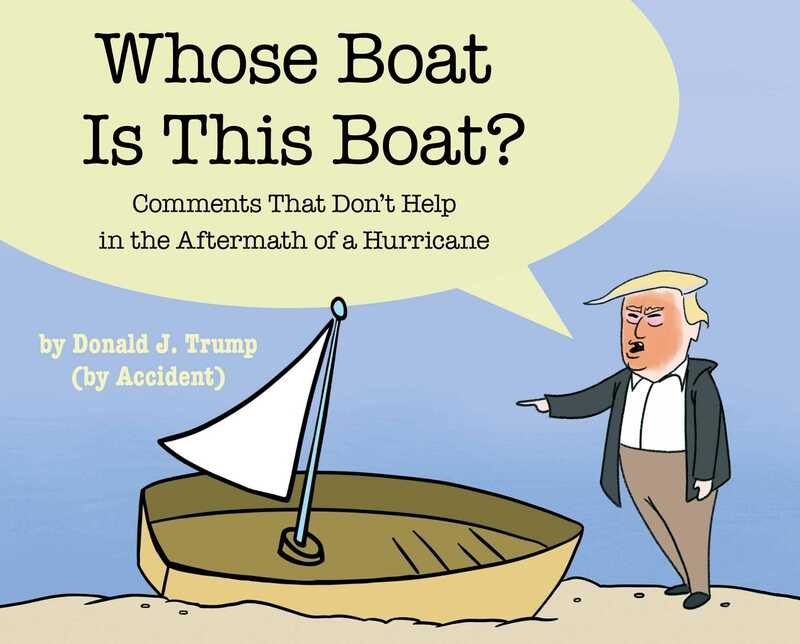 Comments That Don’t Help in the Aftermath of a Hurricane is a picture book made entirely of quotations from President Donald Trump in the wake of Hurricane Florence. It is the first children’s book that demonstrates what not to say after a natural disaster. On September 19, 2018, Donald Trump paid a visit to New Bern, North Carolina, one of the towns ravaged by Hurricane Florence. It was there he showed deep concern for a boat that washed ashore. “At least you got a nice boat out of the deal,” said President Trump to hurricane victims. “Have a good time!” he told them. The only way his comments would be appropriate is in the context of a children’s book—and now you can experience them that way, thanks to the staff of The Late Show with Stephen Colbert. Whose Boat Is This Boat? is an excellent teaching tool for readers of all ages who enjoy learning about empathy by process of elimination. Have a good time! The Staff of The Late Show are bipedal mammals. They were born on earth, and currently reside in the New York City area. Their hobbies include kayaking. Together, the Staff of The Late Show produce CBS’s The Late Show with Stephen Colbert, a CBS show which airs late and stars Stephen Colbert. Book Cover Image (jpg): Whose Boat Is This Boat?